RAFTING IN ECUADOR : best rivers, best companies to go with, tips. Ecuador's river rafting is one of the best in the world and Paddle Rafting is another of our specialties if you want to have a group adventure with friends or family on some Big water world class rafting class IV/V like the Quijos River Host of the 2005 Rafting World Championship or the Lower Misahualli river ( Zambezi style) or a 2 day overnight class IV expedition run down the Hollin river. we will set you up for the ultimate experience on a raft. All of our trips include all rafting gear for you, shuttles, and all of our stuff is been trained to meet the highest standards of safety internationally. Close to the Papallacta hotsprings the Rafting is a world class destination. Roll down the hill and stay in Baeza at a nice hostel and have some fine food. After the papallacta hotsprings you can catcha bus or hire a taxi and go to Baeza. Great backpacker, birdwatcher and kayakers mecca. 2 Hours away from Quito, incredibly scenic and clean no doubt the best river to experience the best rafting in Ecuador. Quijos River offers several sections of river to kayak and raft, we had picked the best to offer specialized and unique adventures. Class III/IV: Big volume and endless rollercoaster feel rapids is what the Quijos river offers for this rafting trip, remote feel and many kinds of birds will amaze you when you get a chance to look around. Class IV/V: Deep into a tide valley runs the Quijos river with its big volume and technical rapids, this trip is for the adventurers searching for the ultimate adventure very comparable to rafting the Zambezi in Africa or the Futalefu in Chile, not for the average traveler just for the adrenaline junkie with previous experience. Why Tena? well there is several reasons why, the quality of the water is much better that other paces in Ecuador thanks that there is no population upstream on most rivers around here keeping them clean and the white water is really amazing, warm and unbeatable. This is one of the best rivers in Tena; the perfect way for travelers to experience the unique diversity of the Amazonian rivers in Ecuador . 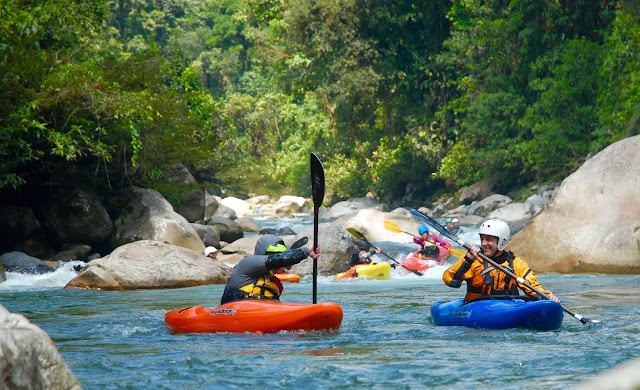 The ride takes you through a variety of friendly action and fun rapids on the Jatun Yacu river, which means BIG WATER in quichua , advanced rafters will enjoy the BIG WAVES and watching the great landscapes of the Napo valley. The trip on the river will last approximately 6 hours depending on the flow of the river. We will make a couple stops during the tour to have a river-side deluxe lunch and to visit a really cool side canyon and check out what do find in there....the tour will end in the small town of Puerto Napo . From there we will make the ten minute return trip to Tena. Length:18.5 miles / 27 km. Minimun pax: 4 Price per person : $50usd. Jondachi - Hollin jungle raft tour, very scenic and beautiful. Want to take the kids rafting? 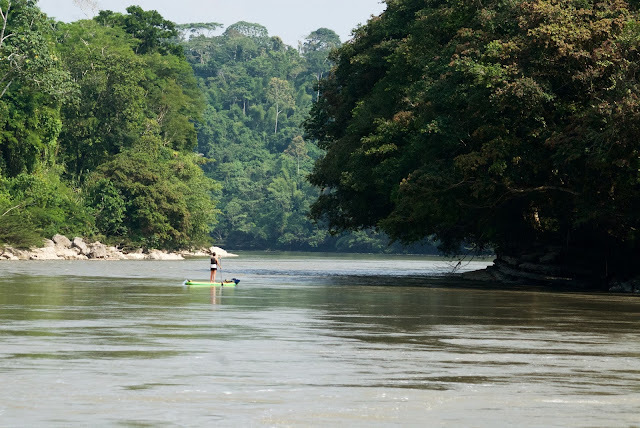 The Napo or the lower Anzu rivers are the perfect choice. You can paddle, swim, or simply lay back and watch the landscape as you pass by Paddling on the river you choose. Adults and children alike will enjoy themselves paddling in rather slow moving water, watching the picturesque landscape but will be also experience excitement with the few small rapids that these river have. Great fun for families that have children and ideal for people who enjoy scenic float trips. Length: 11 miles miles / 17.5 km. The ultimate adventure through the mysterious Amazon jungle's expedition style. The Hollin river cuts through some of the most remote jungle you are likely to find in Ecuador . This river is for people who are looking for adventure and would enjoy a two day rafting tour with one night of camping . This trip includes everything you may need for gear plus the opportunity to be in a place where very few people is been before, great scenery, abundant bird life, and waterfalls that cascade into the river all participants need some prior experience with white water rafting and should be ready for great adventure and camping. Length: 28.5 miles / 46 km. Best Rafting day trip in Ecuador Lower Misahualli ( miss). The Misahualli river is located below the city of Tena just a ten minute drive to the put-in a the beginning the flat water paddling is beautiful landscape and them the Misahualli becomes larger as it combines with the flow of four more major rivers. The rapids are big and powerful and will get demanding at higher water levels, very comparable to the Zambezy river in Africa. It has 1 mandatory portage half way through and very scenic and remote characteristics. All participants need previous experience with white-water rafting. The trip ends when we arrive at one of the major tributaries of the Amazon in Puerto Misahualli. Where Misahualli River joins with Napo River . Length: 15.5 miles / 25 km.